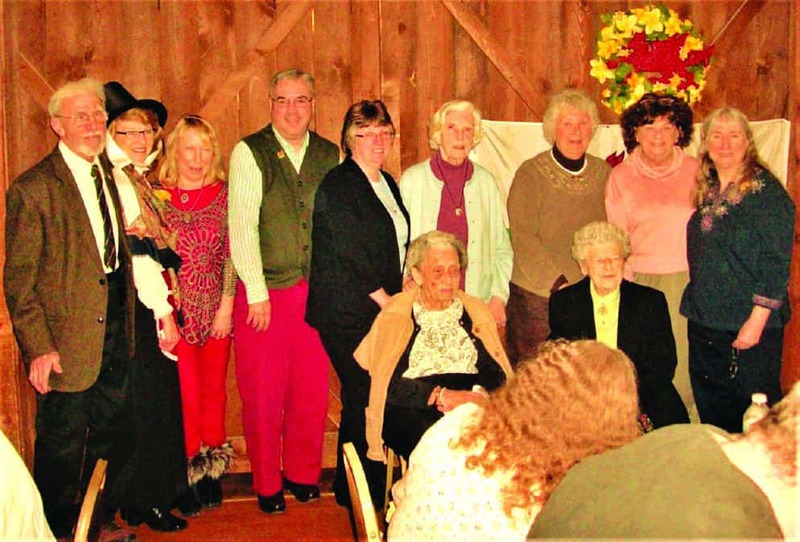 Poultney Area St. David’s Society held its 29th annual St. David’s Day dinner Feb. 26 in the Slate Valley in Granville, N.Y. It was an enjoyable, waited dinner and fellowship gathering which was followed by the society’s program, “Bring Something Welsh” show and tell. The show and tell began with presentations by members and guests after the dinner. Then everyone went across the village to the Slate Valley Museum site where staff gave a private show and tell presentation about many Welsh heritage items in its collection. This included many Welsh love spoons which were hand-crafted by the late William W. Williams, a Welsh and English-speaking member of the society and life-long valley resident. Interesting recent additions to the collection were presented by Krista Rupe, Director, which included many clothing items which date between 1880 and 1920. Light refreshments afterwards was enjoyed by everyone. Standing: Ken Williams, director; Nancy Williams, director, Nia Davies Demiray, 2nd vice-president; Tom Hughes, president; Barbara Hughes Stephenson (not related to Tom), co-treasurer; Marilyn Roberts Duke, treasurer; Una Jean Roberts Capman (not related to Marilyn), director; Shirley J. Scott, Director; Janice B. Edwards, secretary; and seated: Helen Thomas Jones, founding co-president and Lorraine Jones (not Jones relatives), director. Officers missing from the group image include: Carol J. Denniston, director; Hayden Morris, vice-president; Emmett Thomas, director; and Phyllis Thomas, director. All of the officers, with exception of Nia, are Slate Valley Welsh heritage descendants. Nia, who was born in Abersytwyth, Wales, is newly elected 2nd vice president. Barbara is newly elected Co-Treasurer. Virginia Ransom of Hudson Falls, N.Y., the society’s newest member, was introduced. She is a descendant of the “Glyn Williams” clan who were founders of Poultney’s historic Welsh Male Choir. Her show and tell presentation was about them. Also, guests Hugh and Colby Roberts were introduced to the society. Hugh was born in Anglesey, Wales. Hugh is a Veteran of the U.S. Army Infantry, having emigrated to America after 9/11 and enlisted. Residents in Poultney, they are working on college degree studies. Hugh and Secretary Janice are comparing family notes, as Hugh is from a very very small village on Anglesey that Janice’s Taid’s family also originate from. Society members were reminded about the Gymanfa Ganu event the society will sponsor in June at Federated Church of Castleton, Vt.; and members were encouraged to think about and share ideas with the board for events to be organized for 2018, the society’s 30th anniversary year. St. David’s Society officers smile for a picture at the St. David’s Society annual dinner this weekend in Granville, N.Y.